Faced with a long transpacific flight, I loaded lots of reading material onto my new Kindle paperwhite. I’ve found Project Gutenberg to be a great source for interesting free books. 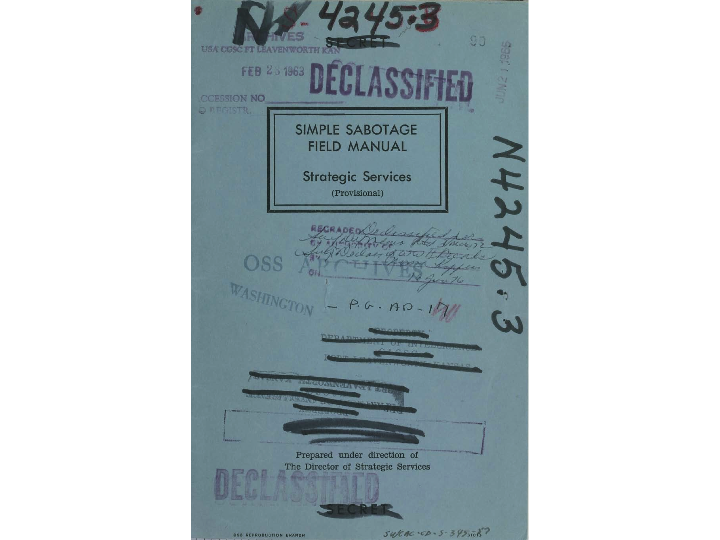 One of the titles I selected was the Simple Sabotage Field Manual. After all, you never know when you’ll be called upon to derail a train or cause a dam to burst. In the coming weeks, I’ll be writing a series of blog posts about SOA governance – a responsibility that’s particularly susceptible to ‘sabotage’. I’ll supply some suggestions to keep things moving along and help avoid this unfortunate outcome. You are currently reading IT committees appear to adopt wartime sabotage tactics at rdschneider.